Recently I decided to learn how to calculate the chance table in the manual and it's harder than it looks. It can be brute forced but it feels like a cop-out. When I began I was convinced that there was an elegant way to get the probability to get X Stars from Y Draws, and there kinda is: Multivariate Hypergeometric Distribution. But even with this there is 58 combinations of symbols that get you at least a Star with 2 Draws. 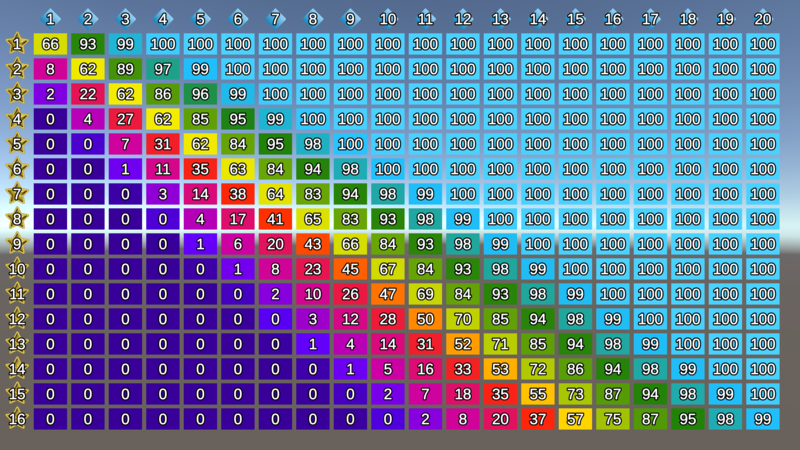 Not only it's a ungodly number of probabilities I still don't know if I can just add together, it dosen't look good for 3, 4, 5, etc, Draws. Anyone knows how to do this or has made a similar attempt? I know you say brute force seems like cheating, but I think this problem is a perfect candidate for monte carlo estimation. 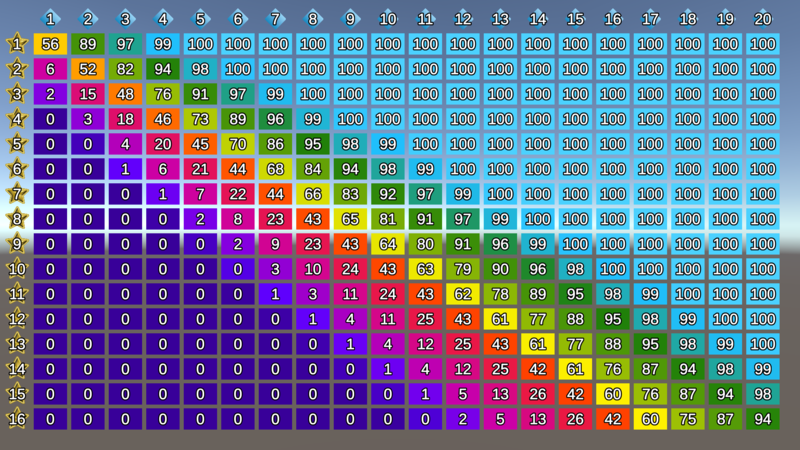 The actual probability calculations to solve this problem are way beyond me, but I could whip up a program to simulate a deck of 7C cards and draw a thousand sample results a second in just a few hours. Perhaps I will attempt that today. Thank you very much for both answers, it was quicker than I expected. Good to know someone already did all the work on this one. I'll try to glimpse something out of that French. I'll study the monte carlo estimation, but for 1 to 7 draws it's only 54 million combinations. Even repeating to calculate 0 to 6 it won't take 10 seconds. If I can get a handle on it I'll try crazy draw sizes. I've begun work on an odds calculator program for The Seventh Continent. Yeah, that looks a lot better than my command line, output to txt code. When you are done, you mind sharing the code? Nothing ever gets done quite as fast as I want it to but here's some progress. Rederived the goat table by monte carlo estimation. These numbers are for a 2-player 1-curse run, with no advanced skills in the deck. - some tiny pernicious bug in my star counting code that makes it sometimes off by 1% or so. This is the difference one makes. This is what activating Mary's skill ability at the start of the game, without advanced skills, gives you. 10% on small checks, less on big ones. This is the impact of Lovecraft's curse ability. It's a little worse than mary's in terms of raw odd when you need lots of successes from few cards and a little better when you need only a few successes from a lot of cards, which sort of makes sense-- hers makes cards that already have stars better, so you're more likely to get a few in a small space. His makes the worst cards better, so it's doing the most work when all you're worrying about is drawing a bunch of curses. It kinda makes sense. Monte Carlo aka "brute force" is definitely not cheating. Not too long ago I read about a monte carlo simulation for Chutes and Ladders, and it was fascinating. Good luck determining the probability of landing on one of the 100 possible spaces, but if you run a monte carlo simulation (and limit the run to prevent infinite loops), you can fairly quickly get a darn good estimate. Would be near impossible to determine those values any other way; simple rules can lead to complex behavior. @brisingre, it might be worth rounding down the 100% to indicate a difference between possible and impossible. 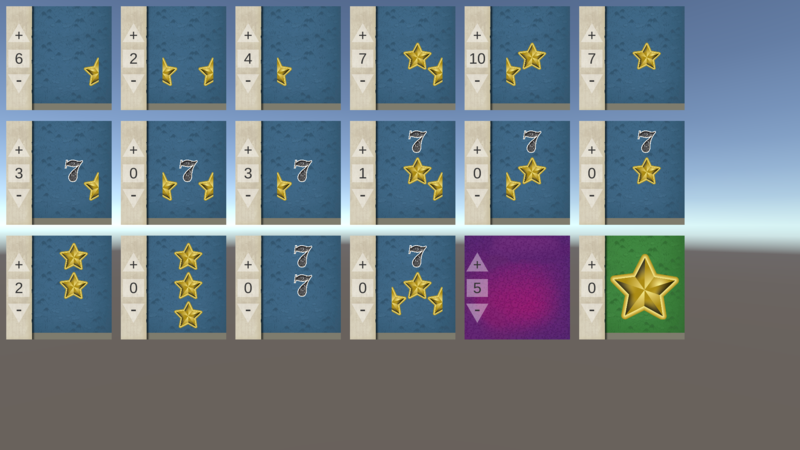 It is possible to draw 5 cards and get zero stars (though very very unlikely), however it is impossible to draw 1 card and get 10 stars. Great job with the table either way! Because it's a monte carlo simulator, I can never say with 100% certainty that something is possible or impossible. I can only say if it happened or not in this random set of data. Technically speaking, I don't know if it could happen or not. Figuring out the best and worst possible result from a given size draw for a given deck doesn't seem like a hard problem to do separately, but, right now it isn't one that I'm doing. Until I do that, 100% won't mean it can't fail, just that it went ~100,000 shuffles without failing. You occasionally see a 0% or 100% that's a slightly off-shade, that's actually a 0.000001-0.5% or a 99.5-99.99999%. The color spectrum doesn't have any rounding. I think you're right though, that if there's even 1 pass it should round up to 1% and if there's even one fail it should round down to 99%. That'd also get rid of those off-color 0s and 100s. So, I ran the number on 1 to 9 , with 0 to 7 for 1 to 4 players. The 7th Continent Draw Results. I wanted to get to 10 draws but it just takes too long, maybe if there is enough interest. I hope it's useful to check your estimates. I understand trying to differentiate the impossible from the unlikely, but some results have chances of 11 in 14 billion, it's too far removed from 1% or even 0,01%. It's not impossible, but only barely. That'll be useful I think. Thanks for sharing your results. There is a mistake in my numbers for 4 Players. I was using int and it's not enough. It takes 3 hours to run so I'll wait for Saturday to run again. Sorry about this. Wow, you actually overflowed an int? Exponents get big, man. As promised, the revised table. I should though. There's not that much more to do.